Looking for a unique and different idea for your next Corporate Team Building Event? Well, look no further as AZDBA is offering a fun-filled afternoon of sun, sand, and surf, in the cool waters of Tempe Town Lake! 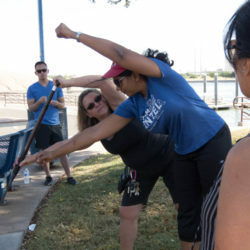 Dragon Boat racing is quickly becoming one of the fastest growing team sports in North America as new clubs and new festivals are sprouting up anywhere a body of water exists. The sport has been called the ultimate team sport as there different sections in the boat, each with a different roles/responsibilities, yet each performing in concert to attain a team goal. Get ready to learn about a cool, hip, edgy new sport, and at the same time, prepare to have a blast at your next Corporate Team Building outing! Bring yourself and a hundred of your closest co-workers to fill up 5 of our Champion 20-man Festival Dragon Boats from China for a few hours of exhilarating dragon boat racing in a friendly competition. The afternoon will be broken into 2 parts, the land portion, then the water portion. Each will last approximately an hour. 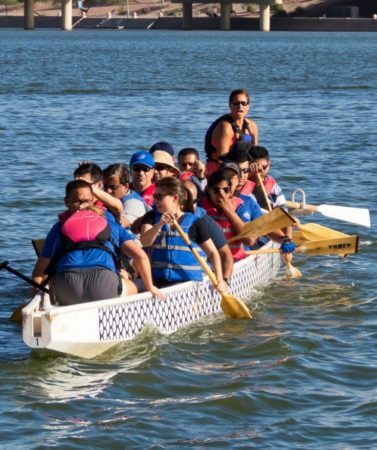 During the land portion of the event, your team will be introduced to AZDBA, the sport of Dragon Boat racing, including the history of the sport, and how a Dragon Boat crew functions from each of the sections of the boat and each of their roles/responsibilities. 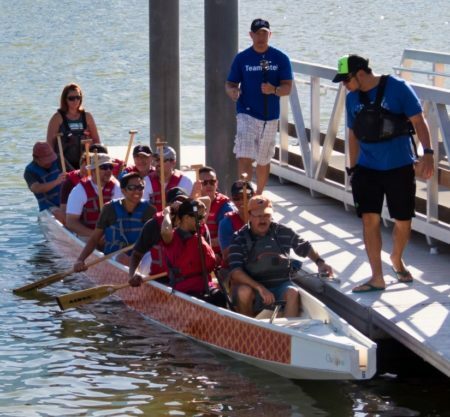 From there, the group will be given basic instruction about boat and lake etiquette, safety, boat commands, basic paddling techniques, and it will conclude by each participant being assigned a role in the boat based on their athletic abilities and physical stature. After a quick set of warm-up exercises, the group will head down to the docks to fill and launch the boats. The water portion of the afternoon will provide participants adequate time to practice executing the boat commands as a team, practice their paddling technique, and to gel together as a team to perfect their synchronization and timing. After the practice session is over, all the boats will line up at the official 250m start line that AZDBA uses for their annual festival, and the boats will be given an official start to compete in the actual 250m race format used by Corporate teams in the annual AZDBA festival. A City of Tempe chase boat will accompany the racing boats and an opportunity will be provided to video tape the race for your team’s viewing pleasure later. The afternoon will conclude with an AZDBA trophy being presented to the winning boat (if there are at least 2 boats used in the Team Building event). AZDBA will provide all equipment (paddles and PFDs) and necessary manpower (coaches and steerspersons for each boat) for the event. Just bring yourself and your team in comfortable play clothes, sunglasses, caps, and sunblock. You will probably get splashed as this is after all a Water Sport! Water and light snacks will be provided for all participants. Get ready for some fun under the sun in what promises to be one of the most innovative and unique team building experiences in your life! If you have any further questions or concerns before booking your event, please feel free to direct your inquiries to corporate@azdba.org. Boat fee is $500 / boat and each boat can accomodate up to 20-paddlers. We offer up to 5 boats for your Corporate Team Building Event. Team Builder Event Season is Oct 1 – Mar 1. Custom AZDBA Corporate Trophy awarded to winning boat!